IGTV is a brand new video-centric application by Instagram. As Instagram passes 1 Billion users, the company announced their new application to focus on videos. Instagram’s IGTV wants to make vertical videos the new norm. IGTV has been integrated into the Instagram application and it also comes as a standalone application. The way IGTV works is quite amazing. After installing this application, users log in using their Instagram profile. The integration between IGTV and Instagram is just like it is between Facebook and Instagram. After logging into IGTV, users can create their channel. Once the channel has been created, they are free to upload videos from their phone. IGTV does not support horizontal videos. However, if you have recorded a video horizontally in the vertical mode, you can definitely upload it by playing a little with the rotation orientation. The videos uploaded to your IGTV channel can be seen by all of your followers. In the IGTV feed, you will find videos uploaded by the people you follow and also the videos from the people that you have shown your interest in. Instagram IGTV is very new at the moment so it makes perfect sense for this application to not to have so many features. At the moment, you can only upload videos by adding a title and the description. Tags like YouTube are not yet available in IGTV. Your friends can like and comment on your videos. There are not any video editing options in this application. It’s just a straightforward upload-and-watch application. The IGTV comes for free and is available in the Play Store all around the world. If you haven’t been able to get IGTV at your end yet, you may want to grab its APK for manual installation. I have found the latest IGTV APK. Instagram lovers can download IGTV APK from here. The instructions to install Instagram IGTV APK are given right next to the download link. 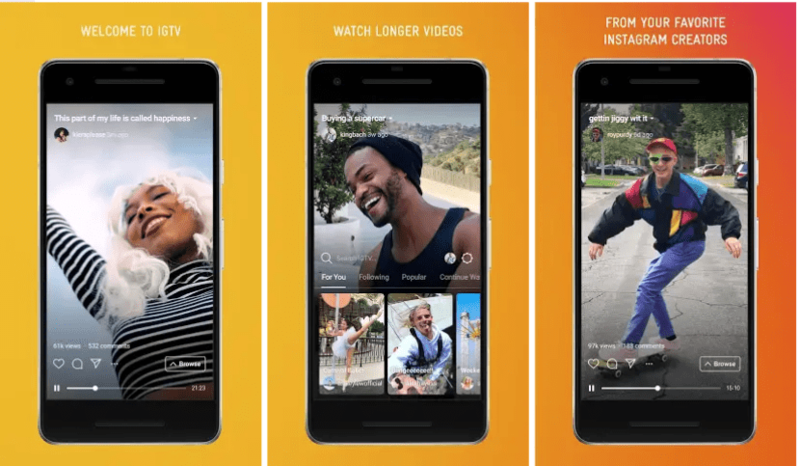 Instagram IGTV APK v50.0.0.41.119 – Download. On your phone, go to Settings > Security or Lock Screen & Security > Unknown Sources > Allow. Now locate the IGTV APK and install it. Open IGTV from the app drawer. Log in now and create your channel. Upload your videos and enjoy!